Obviously there’s been a hiatus since last I posted. 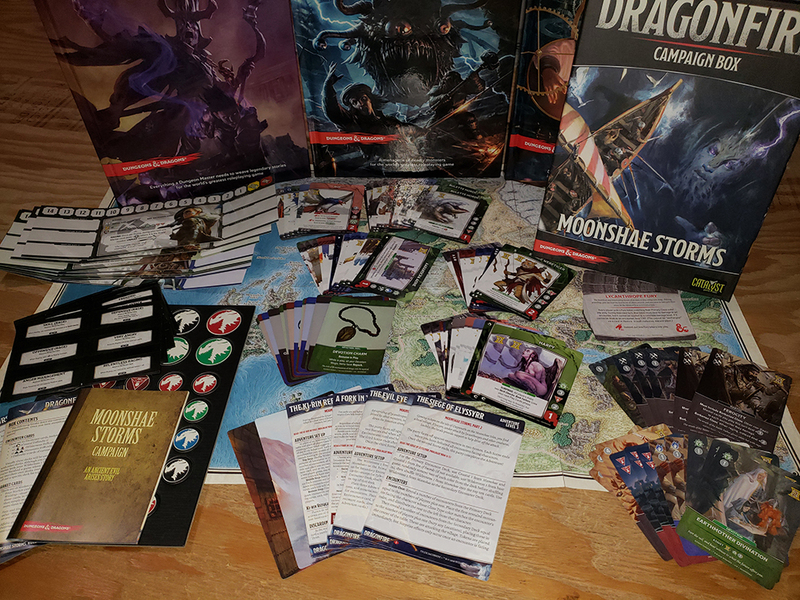 But since that time, our first full Campaign Box has not just found its way to convention goers, but finally reached store shelves, earlier this month. So time to give a nice expose on this fantastic box-o’-Dragonfire awesome. Let’s run down the details. Encounters: There’s more than double the normal encounters from an Adventure Pack, so I’ll break them down by Difficulty Rating. 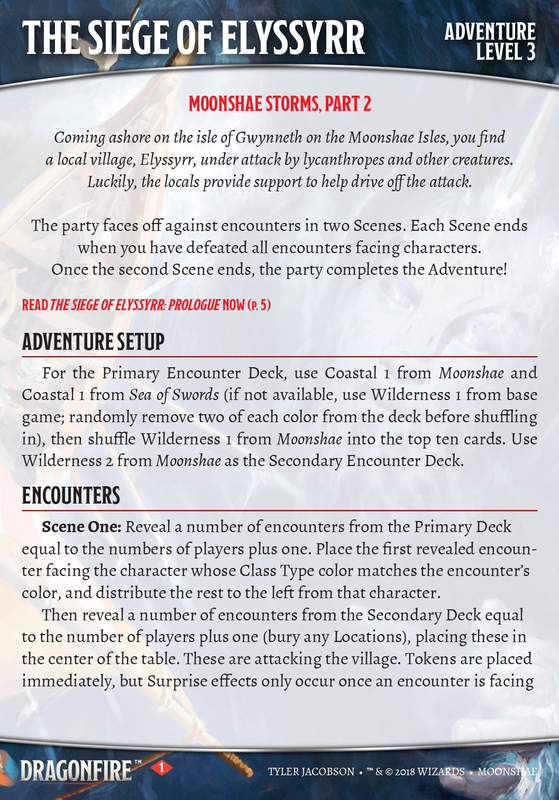 Difficulty 1 Encounters: Ten Coastal encounters build off of those found in Adventure Pack: Sea of Swords, including Water Weirds, Harpys and Pirates. Five lycanthrope Wilderness encounters also bring the flavor of this campaign more fully to life. 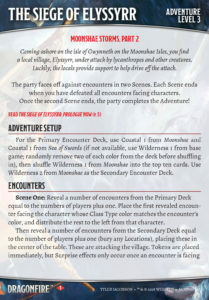 Finally, a brand new Encounter Environment is introduced, Mountains: Aaracocra to Githyanki Warriors, Perytons to Ogres, there’s a pile of great action that’ll bring different challenges to even the standard Dungeon Crawl. 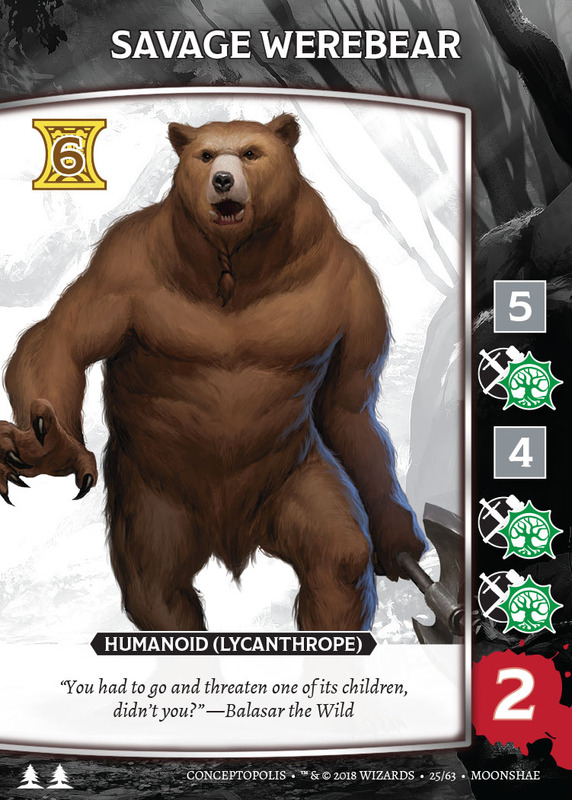 Difficulty 2 Encounters: Ten Wilderness encounters bring an additional eight powerful lycanthropes to the game, including showcasing, for the very first time, different types of damage icons on the same row of an encounters’ damage track. 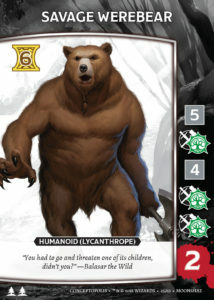 You can see that on the Savage Werebear, arguably the most difficult of the lycanthropes to defeat. The other half of the new Mountains encounters are fifteen cards that include multiple types of Elemental Myrmidons, as well as numerous, nasty Fomorians, and more. Difficulty 3 Encounters: Seven new Difficulty 3 encounters flesh out those from the base game. An Adventurer: Tylk, Storm Giant; three Mountains: a Remorhaz, Cloud Giant Smiling One, and the nasty Fire Giant Dreadnought; and finally, three Coastal: a Roc, Frost Giant Everlasting One, and the crazy-fun Adult Bronze Dragon. As you can see with that last one, depending upon when this encounter comes, you might be able to bribe it (a wonderful nod to the flavor found in the D&D Monster Manual)…but if you fail…ouch! 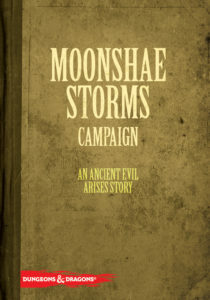 Market Cards: There are two groups of Market cards found within Moonshae Storms. 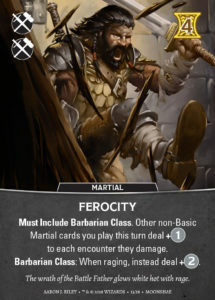 As with the previous Character Classes introduced outside of the base box set–Bard, Druid, Ranger and Warlock–the first introduction of the Barbarian Character Class includes new Market cards. 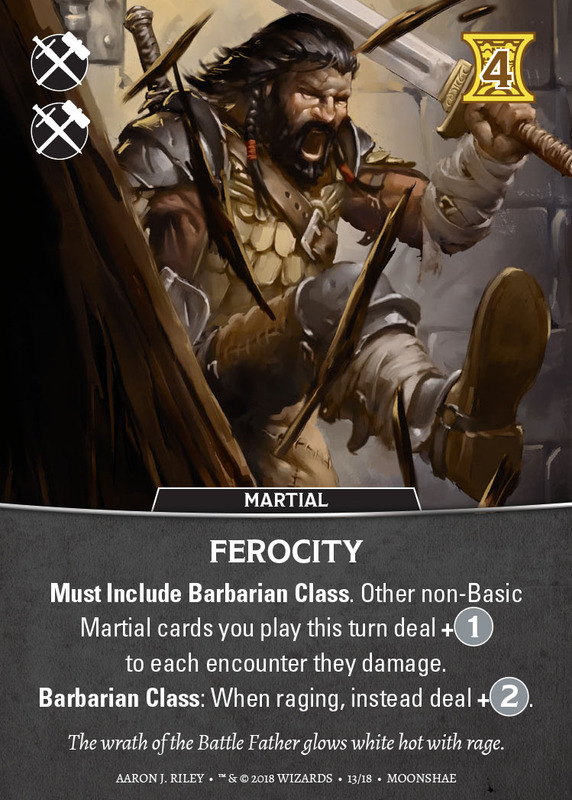 Ferocity and Hurl are two cards that help to bring the Barbarian Class alive at your table. The Barbarian can be a little slow to get moving at the table, but once they’re up and running, they’ll pound well above their weight. The other batch of Market cards are the first designed to be added as a block. 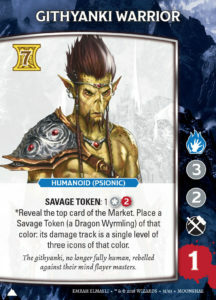 Twelve new cards that’ll give a great boost of alternate playability to any style of Dragonfire game: three each of Dual Wielding (Martial), Veteran Trader (Deception), Earthmother Divination (Devotion) and Magic Weapon (Arcane). Magic Items: Eighteen new Magic Items are brilliant additions you can acquire during gameplay, including six Rares! 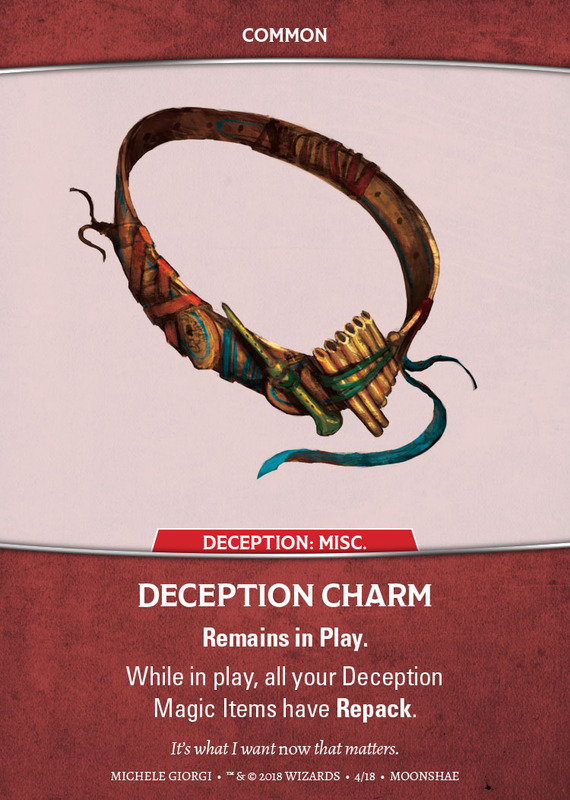 However, it’s the new Common items–such as the shown Deception Charm–that bring a nice boost of playability to all the Common items currently available for use. All the Charm Magic Items are absolute favorites of mine. 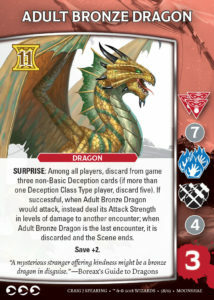 Dragonfire Cards: The Dragonfire Deck remains at the center of this game’s action, and twelve new cards offer a fantastic level of new adventure and challenges. Five of them can be used with any game far beyond this campaign, including the Lycanthrope Fury Dragonfire Milestone card. 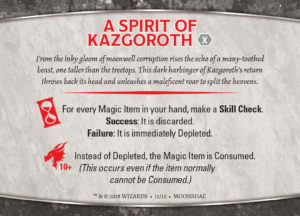 However, seven of them are unique to this campaign, such as the A Spirit of Kazgoroth shown here. 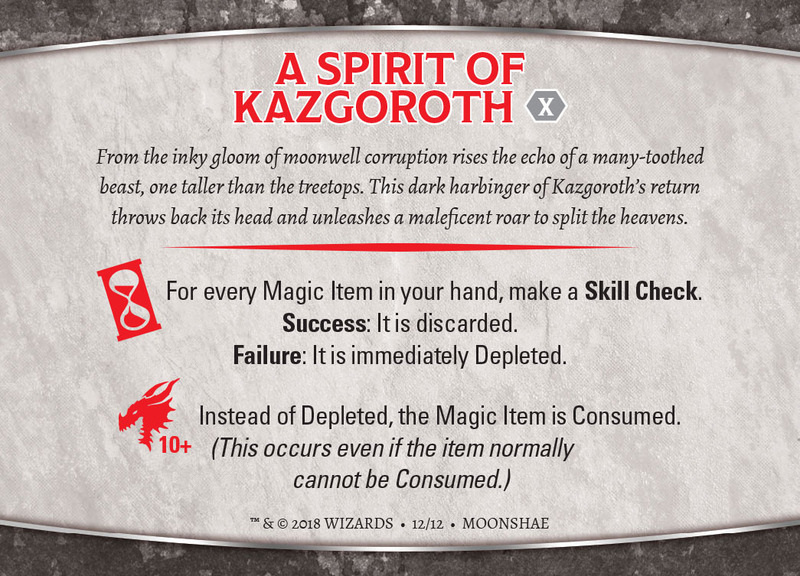 Unlike most of Dragonfire cards, whose names are carefully kept non-specific so they can be used any where and at any time, those seven unique to this box bring out the flavor of the locations and stories of this locale: the previously mention Kazgoroth, along with The Moonwell’s Corruption, Legacy of the Darkwalker Wars, Queen Connomae Commands, A Glimpse of Brokenstone Vale, A Black Blood Tribe Sighting, and The City of Karador’s Shadow. Character Screens: Eight new Character Screens ply new races and Classes, and the requisite tactics that come with it, including: Northlander Human Barbarian, Lightfoot Halfling Druid, Ffolk Human Wizard, Ffolk Human Druid, Moon Elf Wizard, Triton Fighter, and Triton Wizard. Stickers: Six sheets of stickers include a bevy of all new Features. Twenty-four for the Barbarian Class introduced in the Moonshae Storms, along with twelve more that tie into the specifics of this campaign, including another Trophy Feature! 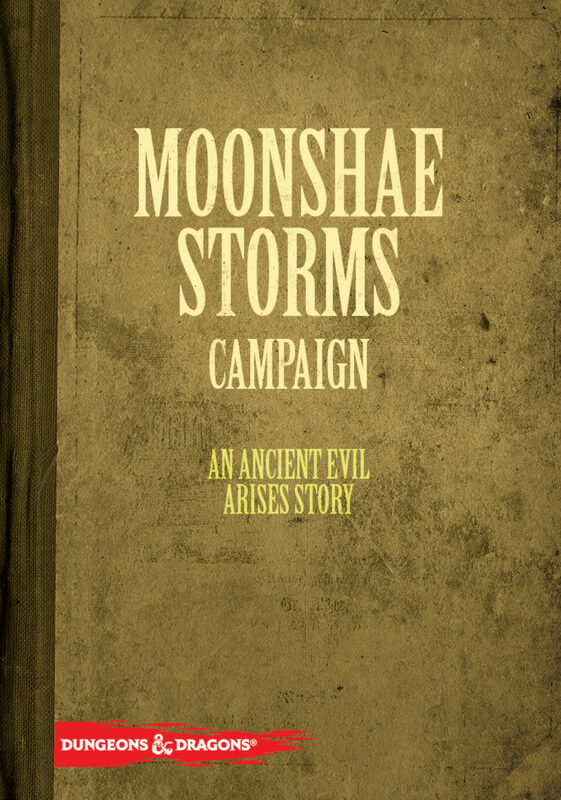 Moonshae Storms Campaign: As with the An Ancient Evil Arises Campaign from the base box, there’s a twenty-eight page fiction immersion booklet that continues that campaign. Prologues and Epilogues from each Adventure provide additional insights, as well as numerous roleplaying moments of alternate options and intrigue. Also, the players will discover the Prophecy of Ash and Flame! 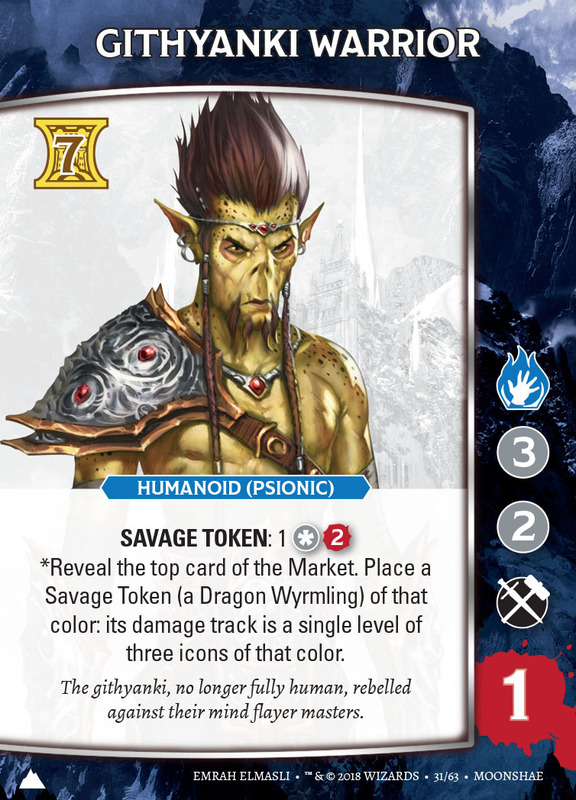 Token Sheet: A new token sheet provides players’ additional Encounter and Character Class tokens, as well as introducing the over-sized “Savage” tokens that are used in various aspects of this campaign. As you can see, there’s so much here to digest and enjoy in many new games. 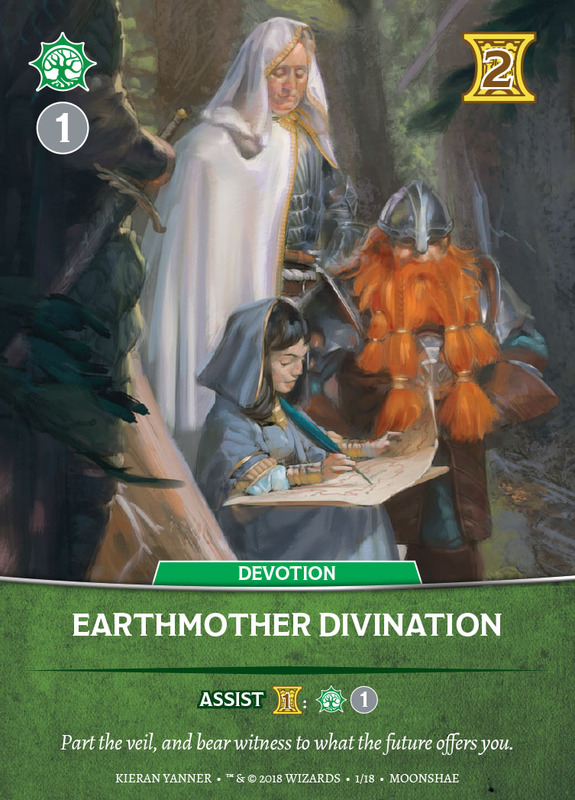 In the coming weeks I’ll return to my dev blog entries and start to describe the various developments that went into this great new Campaign Box. Next PostNext Extra Life & Dragonfire!